Today we’re busy dyeing Easter eggs with the onion skins we’ve collected all year and small flowers from our yard that survived the snow this week. They may not be the bright jewel-tones of the Paas eggs I grew up with, instead they’re lovely and elegant. This entry was posted in holidays, untranslated. Bookmark the permalink. i would like to know how you did this it sound fascinating and fun. I think there very pretty. 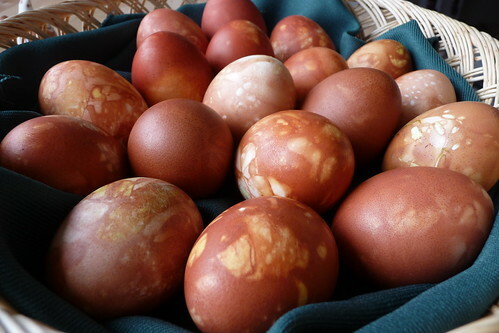 I’ll be posting about how to naturally dye eggs with onion skins on Monday. I hope you stop by and check it out! Priecīgas lieldienas! I hadn’t thought of that – I’ll do that tomorrow, thanks! Aww. I can’t say I’m much better – at this rate, we’ll be dyeing eggs Easter morning instead of eating them for breakfast!